Apple reportedly developing new video service with free original content | What Hi-Fi? Remember last summer when Apple said it was going to invest $1bn on producing its own original content over that next twelve months? Well, we now know more about when and where we can expect to see that content - and unsurprisingly, it’s good news for users of Apple devices. Determined to become a TV titan alongside the likes of Netflix and YouTube, Apple is developing a new video service that will combine original content and existing third-party subscription services, according to reports by CNBC. The service’s Apple-produced content will be free to Apple device owners, while the subscription ‘channels’ (such as HBO in the US) that sit next to it in Apple's TV app will allow users to subscribe to them. You won't have to open that service’s individual app separately. One can only speculate if and how that will be adapted for the UK video service market. The report continues to say that owners of Apple’s iPhones, iPads and Apple TVs will be able to see the unfinished service in the pre-installed ‘TV’ app. Apple plans to officially debut the revised TV app early next year. 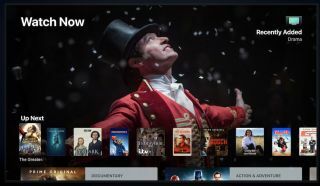 If previous reports are true, Apple device owners could have as many as twenty free Apple shows to binge on, plus a new video service package to access them through, in the next six months.